Background: The fungus Penicillium can cause various infectious diseases in humans and animals. Being present in the environment, its importance in human health has been neglected and is often interpreted as room contaminant. Treatment of regional penicilliosis caused by dimorphic Penicillium marneffei has been according to the protocol available in literature. Objective: The study was conducted to determine the antifungal susceptibility pattern of endemic P. marneffei and other nonmarneffei (NM) Penicillium species in Manipur. Materials and Methods: Clinical and environmental Penicillium species were isolated using standard operating procedure. Antifungal susceptibility of five antifungal agents, namely amphotericin B, voriconazole, itraconazole, fluconazole, and natamycin, was carried out according to the Clinical and Laboratory Standards Institute (CLSI, M38–A2) guidelines. Results: All P. marneffei isolates (100%) showed sensitivity to amphotericin B at ≤1 μg/ml, whereas 96.5% and 76.3% of clinical and environmental NM Penicillium isolates, respectively, were sensitive at ≤1 μg/ml. Clinical isolates were completely inhibited at a concentration of ≤0.25 μg/ml of voriconazole. 30.7% P. marneffei were susceptible at lower minimum inhibitory concentration (MIC) of 0.06 μg/ml of itraconazole, but 31.4% of environmental isolates noted a high MICs of ≥0.5 μg/ml. There was no significant difference in fluconazole MIC among tested strains; however, 10.5% of environmental strains noted higher MIC at 150 μg/ml. 16 μg/ml of natamycin inhibited 100%, 86.2%, and 84.2% of P. marneffei and clinical and environmental NM Penicillium species, respectively. Conclusion: Itraconazole and voriconazole are the drugs of choice for the management of infection caused by P. marneffei and NM Penicillium species. Environmental NM Penicillium isolates with higher MICs may be because of exposure to agricultural fungicides. The fungus Penicillium has approximately 300 species of which Penicillium marneffei (Talaromyces marneffei) is the only dimorphic fungus in the genera with geographically restricted endemicity. It is an important cause of systemic infections among HIV-infected patients. From being a rare disease before AIDS era, the incidence has increased drastically and is now the third most common opportunistic infection among HIV-infected individuals in the endemic area, i.e., Southeast Asia. Case fatality rate is high unless the disease is diagnosed and treated promptly. In 1999, 25% incidence of penicilliosis was reported among HIV-infected patients of Manipur, India. However, incidence of penicilliosis in Manipur has declined significantly due to antiretroviral therapy provided by the National AIDS Control Organization, India since April 2004. Penicillium species other than P. marneffei can cause spectrum of clinical entities and is often associated with superficial and allergic diseases.Penicillium janthinellum and Penicillium canis have been reported to cause pulmonary infection and osteomyelitis. In addition, Penicillium chrysogenum has been documented with cerebral disease apart from pulmonary infection. Not many data on minimum inhibitory concentration (MIC) for the treatment of such cases are available in literature. Moreover, penicilliosis cases among HIV-infected patients in Manipur are managed by administering itraconazole and amphotericin B based on available data in literature. Being an important opportunistic fungal pathogen among HIV-infected patients of the region, the study was undertaken to find out ecological niche of the pathogen in Manipur by collecting environmental samples from bamboo groves, determine the MIC of P. marneffei, and compare it with susceptibility pattern of nonmarneffei (NM) Penicillium species which were isolated from clinical cases and environment samples. Various samples such as aspirates, biopsy samples, and nail were collected according to the standard operating protocols. Direct examination of the clinical specimens by 10% KOH wet mount and staining methods, viz., Gram stain, Giemsa stain, and periodic acid–Schiff stain, was carried out. Fungal culture was done using Sabouraud dextrose agar (SDA) media with chloramphenicol and gentamicin. Phenotypic identification of Penicillium species was based on macroscopic and microscopic features of the mycelia growth. Thermal dimorphism of suspected P. marneffei isolates was confirmed by its characteristic features of the yeast in tissue and/or by in vitro incubation at 37°C. In an attempt to detect environmental niche of P. marneffei, various environmental samples, viz., soil, bamboo leaves, and air were collected from different locations of Imphal district of Manipur. Environmental top soil (0–20 cm) was collected in sterile polyethylene bags. 2–3 g of the soil was suspended in 7–8 ml of sterile normal saline, vortexed, and allowed to settle for 30 s. Further, the supernatant was diluted 1:10 and 1:100. One hundred microliters of diluted suspensions was plated in two SDA plates with antibiotics using spread plate technique. Air sampling of the bamboo groves was performed by exposing the SDA Petri plates for 30 min and incubated at 30°C for isolation and further identification. Plant leaves (bamboo leaves) were cut into 10 mm pieces with a clean scissor. The dorsal and ventral parts of the leave pieces were inoculated onto SDA plates and incubated at 30°C for 5–7 days. Suspected mycelial colonies were processed further for the identification by phenotypic methods. The isolates were tested against five antifungal agents, namely, amphotericin B (Himedia, India), voriconazole (Vozole, Aurolab, Madurai, India), itraconazole (Itral, Jawa Pharmaceuticals, Gurgaon, India), fluconazole (Himedia, India), and natamycin (Natamet, Sun Pharma, Mumbai, India). MICs against Penicillium species were evaluated based on broth microdilution method as recommended by the Clinical and Laboratory Standards Institute, M38-A2, 2008, and their susceptibilities were determined. The reference strain Aspergillus flavus ATCC 204304 was included as control strain. A total of eighty Penicillium strains were isolated from clinical and environmental samples. Forty-two were from clinical cases including 13 P. marneffei from HIV-infected patients with low CD4 count of <100 cell/cumm and 38 were environmental NM Penicillium isolates. No P. marneffei was recovered from environmental samples. With respect to amphotericin B, all 13 P. marneffei (100%) had MIC of ≤1 μg/ml. Four strains (30.7%) of P. marneffei had low MIC of 0.25 μg/ml, whereas the lowest MIC of clinical and environmental NM Penicillium species was 0.5 μg/ml. 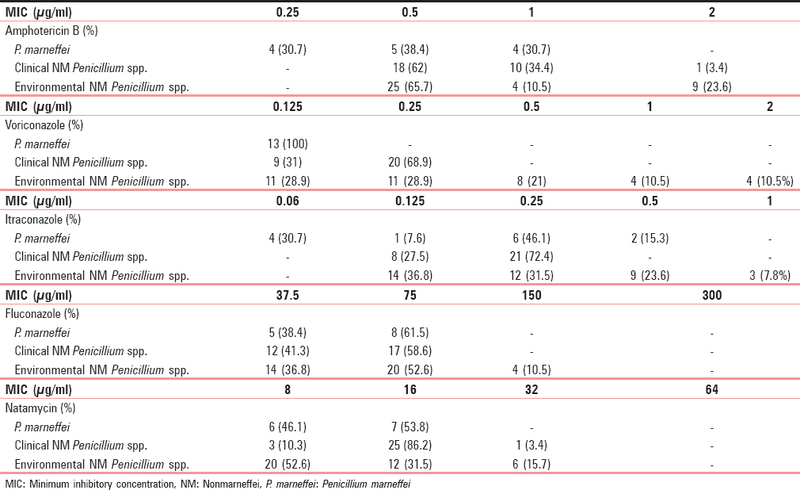 The MIC90 of environmental isolates was 2 μg/ml while that of clinical isolates was noted to be 1 μg/ml [Table 1]. Among the NM Penicillium isolates, higher MIC values of 2 μg/ml were recorded in 23.6% (9/38) of environmental isolates compared to 3.4% (1/29) of clinical isolates [Table 2]. All clinical isolates including P. marneffei were completely inhibited at a concentration of ≤0.25 μg/ml of voriconazole. However, 42.1% (16/38) of environmental isolates recorded MICs of ≥0.5 μg/ml. The MIC90 of clinical isolates, i.e., P. marneffei and NM Penicillium species, was 0.125 μg/ml and 0.25 μg/ml, respectively. Nevertheless, MIC90 of environmental isolates was significantly higher (2 μg/ml) than clinical isolates. 30.7% (4/13) of P. marneffei were susceptible at a concentration of 0.06 μg/ml of itraconazole, whereas NM Penicillium isolated from clinical and environmental sources was not susceptible at 0.06 μg/ml. However, 15.3% (2/13) of P. marneffei had MIC of 0.5 μg/ml while 31.4% (12/38) of environmental isolates noted itraconazole MIC of ≥0.5 μg/ml. P. marneffei and environmental NM Penicillium isolates had same MIC50 and MIC90 at 0.25 μg/ml and 0.5 μg/ml, respectively. Interestingly, fluconazole showed no significant difference among the clinical isolates with all the clinical isolates having MIC of ≤75 μg/ml. However, 10.5% (4/38) strains of environmental NM Penicillium was found to have MIC of 150 μg/ml. MIC90 of environmental NM Penicillium was 150 μg/ml which was higher than that of P. marneffei and NM Penicillium. 16 μg/ml of natamycin inhibited 100%, 86.2%, and 84.2% of P. marneffei and clinical and environmental NM Penicillium isolates, respectively. However, 6 (15.7%) environmental isolates had higher MIC of 32 μg/ml compared to 3.4% of clinical NM Penicillium isolates. Penicillium species for long has been underestimated as a causative agent of infectious disease, except P. marneffei, the causative agent of invasive fungal disease, penicilliosis. More focus has been on the fungi for production of antibiotic and secondary metabolites for the treatment of diseases and industrial applications. Penicillium species is ubiquitous in nature, and very often, it is interpreted as a common laboratory contaminant. However, cases of NM Penicillium implicating human and animal infections have already been reported.,, Yet, a thorough study on NM Penicillium infection is lacking. Having reported penicilliosis from Manipur for the first time in India in 1999, the disease is confirmed to be endemic only in northeast region of India till today. Management of such cases is based on the available data from literature. This study looked into the regional aspect of the pathogen with an attempt to isolate the pathogen from environment, establish the antifungal susceptibility profile of the isolates, thereby providing best options to a treating clinician for appropriate management. In congruence to the present finding, P. marneffei was demonstrated to be highly susceptible to itraconazole  apart from amphotericin B., Although in this study, P. marneffei susceptibility was determined for mycelial form, Sar et al. determined MIC for yeast and mycelial form and found varying susceptibility. According to the latter author, the MICs of amphotericin B for the mycelial form were higher than those recorded for the yeast form with geometric mean titers of 2.994 μg/ml and 0.122 μg/ml, respectively. Again, MICs of ketoconazole were lower for the yeast form (0.021 μg/ml) than for the mycelial form (0.400 μg/ml). Similarly, the MICs of itraconazole were similar for the mycelial and yeast forms (0.020 μg/ml and 0.007 μg/ml, respectively). In another study, voriconazole was found to be more susceptible than other antifungal agents, which is similar to the present study and the MICs of other antifungal agents, in order of lowest to highest were itraconazole, terbinafine, amphotericin B, and fluconazole. In our study, it was voriconazole, itraconazole, amphotericin B and natamycin. Sekhon et al. used different methods to test the susceptibility of mycelial and yeast form. The MIC and minimum fungicidal concentration for mycelial forms to amphotericin B were 0.78–1.56 and 0.78–3.125 mg/L, respectively. In our study, MIC for the tested mycelia forms ranged from 0.25 to 1 μg/ml. Environmental NM Penicillium isolates have higher MICs compared to clinical isolates is a finding to be noted and study further. Human infection with such isolate is likely to be difficult with a possibility of developing drug-resistant fungal infections. Studies have supported the hypothesis of acquiring infections with antifungal resistant Aspergillus fumigatus from environmental sources because of the widespread use of agricultural fungicides. Such isolates with higher MIC compared to clinical isolates needs to be further investigated in the light of azole resistant fungi such as A. fumigatus due to exposure to pesticides and insecticide in soil. Penicillium species remains to cause significant morbidity in human. Voriconazole and itraconazole are better option for treatment of infections caused by dimorphic, P. marneffei and NM Penicillium species. The higher MIC in few of the environmental isolates might be because of previous exposure to agricultural antifungal pesticides. The study was supported by the Department of Biotechnology, Government of India. Sirisanthana T. Penicillium marneffei infection in patients with AIDS. Emerg Infect Dis 2001;7:561. Supparatpinyo K, Nelson KE, Merz WG, Breslin BJ, Cooper CR Jr., Kamwan C, et al. Response to antifungal therapy by human immunodeficiency virus-infected patients with disseminated Penicillium marneffei infections and in vitro susceptibilities of isolates from clinical specimens. Antimicrob Agents Chemother 1993;37:2407-11. Deng Z, Ribas JL, Gibson DW, Connor DH. Infections caused by Penicillium marneffei in China and Southeast Asia: Review of eighteen published cases and report of four more Chinese cases. Rev Infect Dis 1988;10:640-52. Gill MV, Paul ES, Michael GR, Maren AK, Burke AC. Penicillium janthinellum in sputum and bronchoalveolar lavage in an AIDS patient with pneumonia. J Microbiol Infect 1997;3:261-4. Langlois DK, Sutton DA, Swenson CL, Bailey CJ, Wiederhold NP, Nelson NC, et al. Clinical, morphological, and molecular characterization of Penicillium canis sp. nov. isolated from a dog with osteomyelitis. J Clin Microbiol 2014;52:2447-53. Lyratzopoulos G, Ellis M, Nerringer R, Denning DW. Invasive infection due to Penicillium species other than P. marneffei. J Infect 2002;45:184-95. Li X, Yang Y, Zhang X, Zhou X, Lu S, Ma L, et al. Isolation of Penicillium marneffei from soil and wild rodents in Guangdong, SE China. Mycopathologia 2011;172:447-51. Clinical and Laboratory Standards Institute. Reference Method for Broth Dilution Antifungal Susceptibility Testing of Filamentous Fungi. Approved Standard; Document M38-A2. Wayne, PA: CLSI; 2008. Sar B, Boy S, Keo C, Ngeth CC, Prak N, Vann M, et al. In vitro antifungal-drug susceptibilities of mycelial and yeast forms of Penicillium marneffei isolates in Cambodia. J Clin Microbiol 2006;44:4208-10. Hsueh PR, Teng LJ, Hung CC, Hsu JH, Yang PC, Ho SW, et al. Molecular evidence for strain dissemination of Penicillium marneffei: An emerging pathogen in Taiwan. J Infect Dis 2000;181:1706-12. Liu D, Liang L, Chen J.In vitro antifungal drug susceptibilities of Penicillium marneffei from China. J Infect Chemother 2013;19:776-8. Sekhon AS, Garg AK, Padhye AA, Hamir Z.In vitro susceptibility of mycelial and yeast forms of Penicillium marneffei to amphotericin B, fluconazole, 5-fluorocytosine and itraconazole. Eur J Epidemiol 1993;9:553-8. Chowdhary A, Kathuria S, Xu J, Meis JF. Emergence of azole-resistant Aspergillus fumigatus strains due to agricultural azole use creates an increasing threat to human health. PLoS Pathog 2013;9:e1003633.